The National Fragile X Foundation and our members are closely tied to autism: FXS—one of the more than 800 genes associated with autism—is the most common known single gene cause of autism, accounting for 1%–6% of all cases. Additionally, 46% of males and 16% of females with FXS have been diagnosed or treated for autism. 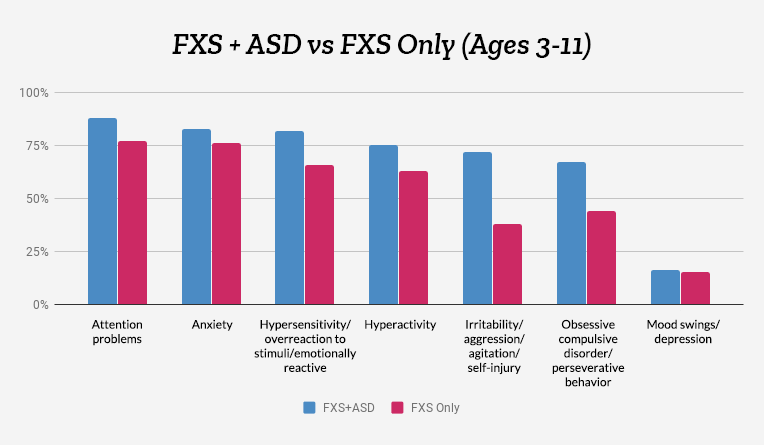 To mark World Autism Awareness Month, we take a look at behavioral issues in individuals with FXS plus ASD and compare them to those with FXS alone. What is the FORWARD Registry & Database? In order to conduct well-designed clinical trials that capture the entire spectrum of the disorder, the natural history of those with Fragile X syndrome needs to be determined. This is particularly true for adults with FXS, about whom almost nothing is known regarding life trajectory and medical complications. Supported by grants from the CDC, the FORWARD Registry & Database (a project of the NFXF Fragile X Clinical & Research Consortium) was created to increase the scientific and clinical understanding of Fragile X syndrome. One of the best ways for families to help advance our understanding and to improve treatment is to become part of the FORWARD Registry & Database. You can learn more about joining by contacting your nearest Fragile X Clinic. There are many different types of behaviors associated with ASD, regardless of ASD status and age, particularly attention issues and anxiety. In the first large scale study looking at autism in FXS, and using FORWARD and Fragile X clinic data, the charts below shows behaviors associated with FXS+ASD and FXS only, by age group (ages 3–11 and 12–21), in subjects enrolled in theFORWARD Database from September 7, 2012, through August 31, 2014. In general, the behavioral profiles were similar in both age groups. 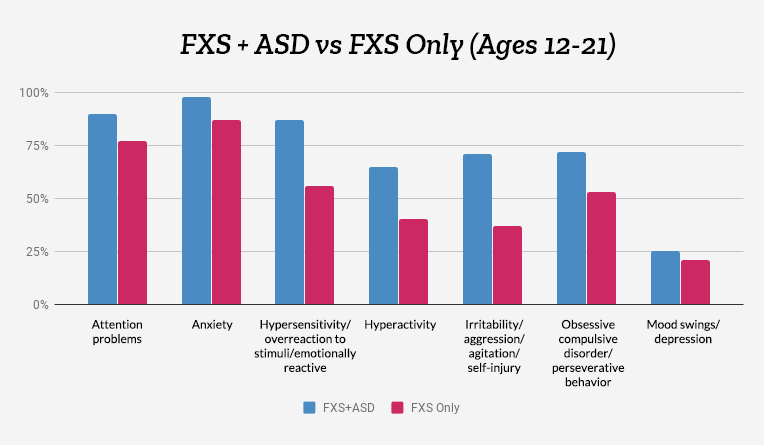 Regardless of their relative frequency, however, hyperactivity, hypersensitivity/overreactivity, perseverative/obsessive compulsive behavior, and irritability/aggressive behavior was much higher among those with FXS+ASD versus those with FXS only. The difference between FXS+ASD and FXS was less striking for anxiety, with only the older (ages 12–21) FXS+ASD group showing significantly higher anxiety than FXS only (98% vs. 87%). As a whole, mood swings/depression problems were less common (∼18%), with no significant difference between FXS+ASD and FXS only. Behavioral problems associated with FXS+ASD and FXS only, by age group, in subjects enrolled from September 7, 2012 through August 31, 2014, FORWARD Database. FXS+ASD individuals were about 3x more likely to experience seizures. Sleep problems requiring treatment were found in 4 out of 10 with FXS+ASD vs. 3 out of 10 for FXS alone. Aggressive/disruptive behavior was treated with medication in 4 out of 10 of individuals with FXS+ASD vs. 2 out of 10 for those with FXS alone. Other behaviors were treated similarly in both groups. Separately, FXS and ASD share many overlapping issues, so it’s important to understand these differences to ensure an accurate diagnosis. Most FXS behavioral issues trace back to anxiety and hyperarousal. Autism’s behavioral roots and manifestations are more complex and multi-faceted, which makes it essential to understand the root of the behavior before committing to a treatment plan. And while parents may be well aware of the differences between FXS, ASD, and FXS+ASD, teachers, clinicians, and other professionals, need to understand that FXS+ASD isn’t merely a sum of its parts. But if FXS is just one cause out of an unknown number for autism, how does one affect the other? Unfortunately, we don’t yet know the answer to this question. Watch videos related to autism on Vimeo. We really liked “Sensory Overload” for its beautiful animation and how well it illustrated this common symptom of autism. And of course videos on autism on YouTube, where we found another wonderful animated video that explains the brain of someone with autism (most of which could apply to others with atypical brains). “Autism—What We Know (and what we don’t know yet),” from Simons Foundation geneticist Wendy Chung. “The World Needs All Kinds of Minds,” from Temple Grandin, who was diagnosed with autism as a child. “What I’ve Learned from My Autistic Brothers,” from writer Faith Jegede. We have been busy putting more information about Fragile X and autism together as a resource here at fragilex.org, and have been compiling facts, information, articles, webinars, information on studies and research, and will continue to add more as they become available. It is ever changing, but in the meantime, check out Fragile X & Autism. And watch for more information throughout the month of April, here and on social media. And if you haven’t already, don’t forget to subscribe so you don’t miss anything. This study looks at important differences in ASD symptoms between individuals with FXS+ASD and those with ASD alone. Fragile X expert Dr. Hagerman discusses the important link between FXS and autism, and new developments and treatments for both. The two conditions may have considerably more overlap than previously thought. Recommendations based on the information collected from all the families who participate in FORWARD and other scientific research. By Randi J. Hagerman, Susan M. Rivera, and Paul J. Hagerman.